Newspaper newsrooms and local TV stations across the country are seeing shrinking reporting power amid diminishing resources, according to a new report by the Pew Research Center. Newsroom cutbacks in 2012 are putting the industry down 30 percent since its peak in 2000, and for the first time since 1978, there are fewer than 40,000 full-time professional employees. "This adds up to a news industry that is more undermanned and unprepared to uncover stories, dig deep into emerging ones or to question information put into its hands," the report said. This was the most evident in the political reporting during a contentious election year, when campaign reporters functioned "primarily as megaphones, rather than as investigators, of the assertions put forward by the candidates and other political partisans," according to the report. It added that this trend is seen in other beats, as cutbacks have left a void that is being filled by other means like public relations employees. Local television stations have been hit the hardest, as live stories fell 30 percent from 2007 to 2012. Interview segments, which take up fewer resources, were up 31 percent. The public has taken notice, the report says. Thirty one percent of adults have stopped turning to news outlets, saying they were no longer getting the kind of coverage they expected. People surveyed cited lack of beat expertise, fewer stories and less complete news stories as reasons they abandoned a news outlet. Some newsrooms, however, have begun charging for their online content to subsidize and improve reporting quality. The report says 450 of the country's 1,380 dailes have implemented a pay wall for online content and that the practice could have big payoffs. "The rise of digital paid content could also have a positive impact on the quality of journalism as news organizations strive to produce unique and high-quality content that the public believes is worth paying for," the report said. 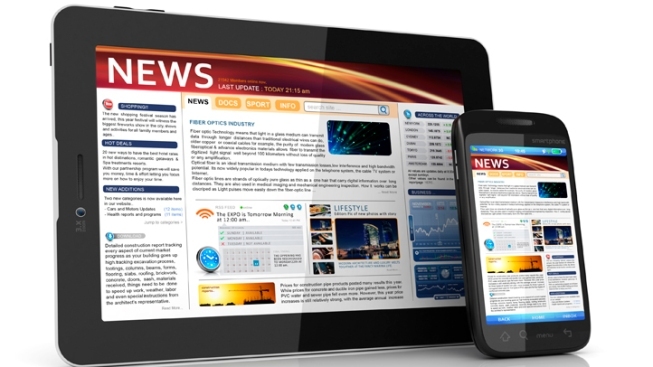 According to ComScore.com, digital news consumption from the top 25 news sites increased by 7.2 percent in 2012. Pew data indicated that 39 percent of respondents get their news online or from a mobile device, up from 34 percent the last time the survey was conducted in 2010. Still, newsrooms have failed to harness the power of digital advertising as a revenue source, according to the Pew report. Local digital advertising — a critical ad component for local news — grew 22 percent in 2012, but improved geo-targeting has pushing national advertisers to turn to Google and Facebook for ad space that once went to local media. Social media is also taking on a larger role as a source for news information. Fifteen percent of adults get their news from friends on social media, and about 77 percent of them are reading news stories through links on these sites, according to the Pew study.